Looking at a band’s discography and attempting to decide where to start is often a challenge—this is especially true if the band has a large number of releases spanning multiple decades. The Beautiful South appears to be one of those bands at first, with ten albums over the course of close to twenty years. However, a quick glance at the very first item of that list, and the decision is automatically made. 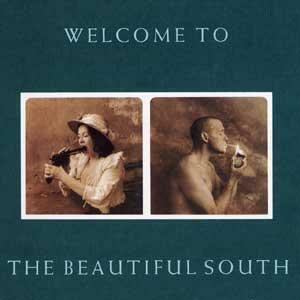 There’s obviously no better place to start with a band called The Beautiful South than on a record called Welcome to the Beautiful South. Now that’s some foresight on their part. Anyway, all boring insights into the Swole Ear record selection process aside, Welcome is an interesting record, and would probably hold more of my attention if I didn’t have to write this post. This is clearly a lyric-centric band—Gareth of Los Campesinos! often points to frontman Paul Heaton as a major influence—and the lyrics that I actually heard were pretty good. Whether thanking the various (presumably) ex-lovers that inspire his songwriting in Song for Whoever, or telling a grim murder story in the vein of The Tell-Tale Heart with Woman in the Wall, it’s clear that Heaton has a way with words. It may be a fairly depressing and bleak way with words (just look at that cover), but a way nonetheless. Unfortunately, I missed most of the lyrics while writing this entry, but I’m sure that this record will be getting another spin out of me in the near future.